The Pahu is a beautiful pendant light made with stunning hand-crafted glass. 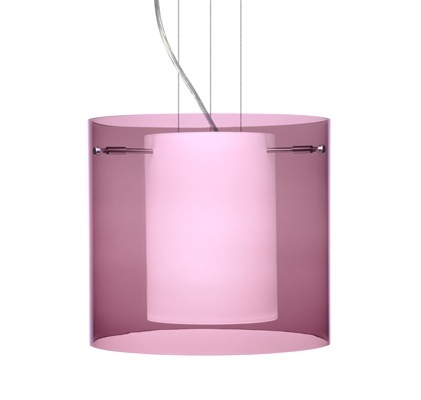 With an inner opal shade and outer transparent glass shade, this light has a unique and sophisticated look. Perfect for your kitchen or other living space. Available in three sizes and two finishes. Get creative and place this in your bathroom or work area! Standard lamping for 8" and 12" is 1 x 100 Watt incandescent; for 16" is 1 x 150 Watt incandescent, suitable for dimming. Bulbs not included. Cable Hung Suspension: 3 x 10' stainless steel cable support with 10' AWM-type cord. 5" diameter canopy is plated stamped steel. Suitable for damp locations (interior use only).